Surgical hair restoration means having a hair transplant. The hair transplant surgeon moves hairs from an area of thicker hair to the balding areas. Surgical hair restoration is the only permanent solution to many types of hair loss including male pattern baldness. But not everyone is a candidate for hair restoration surgery. The most important factor that affects candidacy for surgical hair restoration is the diagnosis. What is the reason for the hair loss? A hair stylist is not qualified to diagnose the reason for hair loss. Only a doctor, preferably a dermatologist or hair transplant surgeon, is qualified to diagnose the reason for hair loss. Lab tests may be needed to ensure an accurate diagnosis. Hair loss in men is often caused by a genetically-linked condition called male pattern baldness. Hair on the top and front (hairline) of the scalp is genetically pre-programmed to be sensitive to testosterone. >Continue reading Factors That Can Affect Candidacy for Surgical Hair Restoration” />As a man ages, more and more hair falls out until they can be completely bald on the front and top of their head. Certain prescription medications and supplements can accelerate this process. These men are usually good candidates for hair restoration surgery, because the transplanted hair will not fall out. Additionally, they have plenty of hair on the back and sides of the head to take hair from (donor hair). Hair loss in men can have other causes, such as fungal infections or medical problems. When the underlying cause of hair loss is addressed, the hair may or may not grow back. Women often lose hair due to hormonal problems. Lab tests are an important diagnostic tool. When the hormonal problems are addressed, the lost hair does not usually grow back. So long as the woman’s hormones are kept in balance, they are usually a good candidate for hair transplant surgery. Female hair loss due to hormonal problems is usually diffuse, meaning that it thins everywhere or falls out in patches. A few women are subject to male pattern baldness, and can be treated successfully with a hair transplant. Hair is such an important part of women’s appearance that women sometimes inadvertently subject their hair to damaging stressors. For example, hair loss can be caused by hair styles that pull, such as braids and tight buns. Hair relaxants can chemical cause burns resulting in hair loss. When the damage is permanent, many of these ladies could improve their appearance with a hair transplant. Some cases of hair loss are caused by an auto-immune disorder called alopecia areata. T-cell lymphocytes attack the hair follicles, causing the hair to fall out. Blood tests and a scalp biopsy may be needed. People with hair loss due to auto-immune disorders are not candidates for a hair transplant because the immune system would attack the transplanted hair, and it would fall out again. A certain amount of donor hair is needed to have a hair transplant. Donor hair comes from a part of the scalp that has plenty of hair. It is best to start investigating hair transplants as soon as a diagnosis is made. If you wait until most of your hair is gone, the surgeon will have to transplant many more hairs, and possibly recommend multiple “sittings” (hair transplants). The donor hair needs to be used wisely, and there is an optimal time to start with your first hair transplant in order to meter the donor hair out over time. Additionally, a study has shown that taking Dr. Shapiro’s Help Hair Shake helps make hair thicker and fuller, possibly delaying the need for future hair transplants. This supplement had the added effect of increasing the speed with which the transplanted hair started growing again in the weeks directly after the transplant (Accelerated Follicular RestorationTM or AFRTM). Sometimes, people are not considered candidates for a hair transplant because the donor hair is too weak. 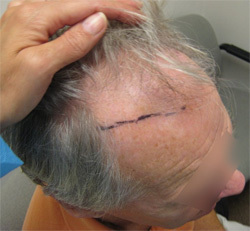 One female patient in this situation took Dr. Shapiro’s Help Hair Shake for three months, which made the hair strong enough that she was able to have a successful hair transplant. Many factors influence whether an individual is a candidate for surgical hair restoration. This article is for information purposes only. An in-person consultation with a hair transplant surgeon will help determine whether an individual is a candidate for hair transplant surgery. 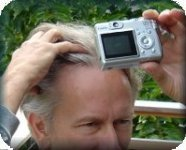 This entry was posted in Baldness, Genetics, Hair Damage, Hair Loss, Hair Loss in Women, Hair Transplant, Hair Transplants on August 24, 2010 by Larry Shapiro.